Children born on or near Christmas know what it's like to get lost in the hustle and bustle of the holiday season. 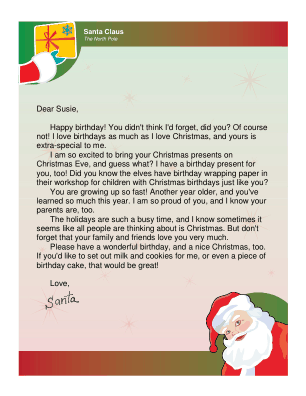 This printable letter from Santa gives a Christmas baby the attention and acknowledgement he or she craves. Happy birthday! You didn't think I'd forget, did you? Of course not! I love birthdays as much as I love Christmas, and yours is extra-special to me. I am so excited to bring your Christmas presents on Christmas Eve, and guess what? I have a birthday present for you, too! Did you know the elves have birthday wrapping paper in their workshop for children with Christmas birthdays just like you? You are growing up so fast! Another year older, and you've learned so much this year. I am so proud of you, and I know your parents are, too. The holidays are such a busy time, and I know sometimes it seems like all people are thinking about is Christmas. But don't forget that your family and friends love you very much. Please have a wonderful birthday, and a nice Christmas, too. If you'd like to set out milk and cookies for me, or even a piece of birthday cake, that would be great!